The Pinterest is a mysterious thing, and one of those mysteries for me has always been what in the hell ModPodge is. 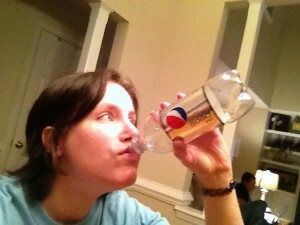 Apparently, it is a substance which you buy from the craft store which you can then use to stick stuff on other stuff. If it sounds like glue… that’s because it is. And, surprisingly (/sarcasm), it’s not hard to make yourself. So, tutorial in hand, I embarked on my mission to make my own ModPodge. First, I sucked down a Diet Pepsi. 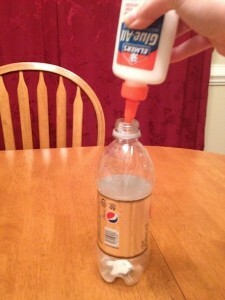 Next, I squeezed some glue into the empty bottle. Shake that thing, Miss Kana Kana. Now what shall I do with my homemade ModPodge? Stay tuned to find out. I’m sure it will be epic. I absolutely cannot wait to see what you do with this! P.S. 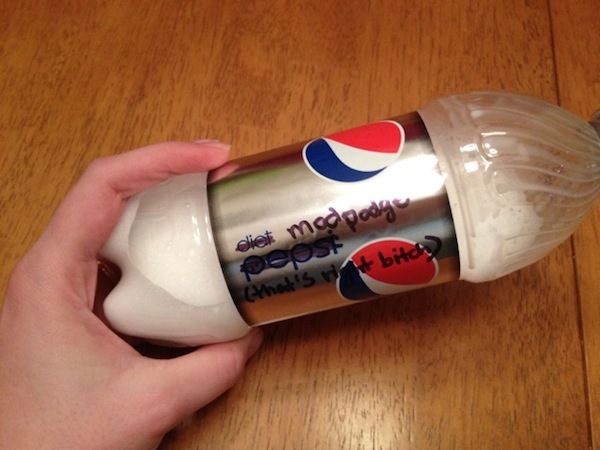 If you add some Borax to that, it will turn into home-made Silly Putty! 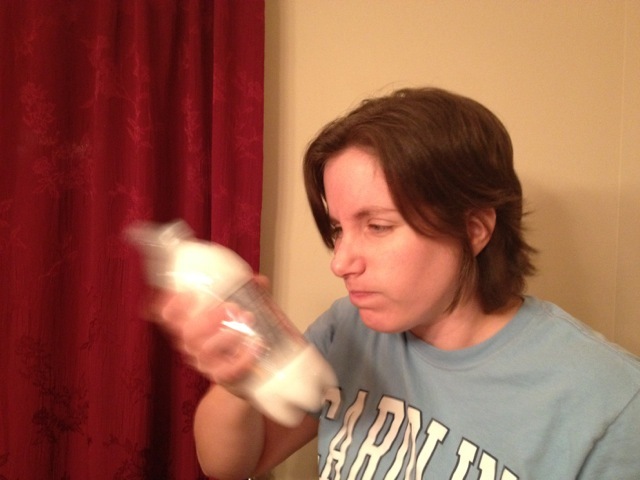 Borax? How the hell do people figure this stuff out? Oh, there are TONS of ModPodge craft ideas on Pinterest that you could try out. I actually have one pinned that I plan to do (but with the photo modpodge). I have one involving a balloon. It promises to be a gigantic fail. I can tell already. oooh i’ve some balloon ideas that are destined for epic fail if i tried them. Good job on the mod podge. I look forward to seeing if this stuff actually works. 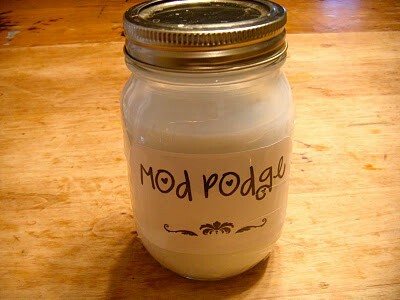 Mod podge is much more than just glue, it has other chemicals and crap in it that make it have super human (or glue?) strength. 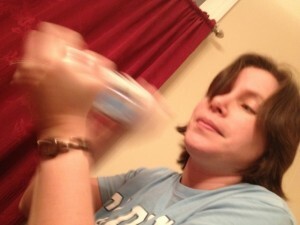 This stuff they call “DIY mod podge” won’t work, think about it watered down glue?! It doesn’t even work out in my brain. The folks at pintrosity tries this and the recipe failed. You should try for yourself, good entertainment I suppose. Mod Podge, when dry, is a waterproof sealant. Elmers glue is not, haha. It is not waterproof. We used it last year at camp where it commenced in a biblical flood. The modpodge washed off by day 3 and the signs were ruined. Your’s looks far too thin. Real Modpodge coats the container in white opaqueness. As a first grade teacher, I use this stuff for tons of things! One of the kid’s favorite activities is making glow in the dark Halloween Ghost necklaces for safe trick or treating. I will save you the tutorial, but it involves mixing glow in the dark paint and Modpodge in a squeeze bottle, squeezing it in the shape of a ghost on wax paper, adding googly eyes and a string…PRESTO. I thought I would say that I tried making a mouse pad using a Pinterest post. It involved both modge podge and sewing. Let’s just say it was a big-time Pinterest fail. I made this as well… it sucked! It was super thin and didn’t work at all like Mod Podge should work. Are you a Tar Heel?? I graduate in ’98 with a BA in History and English. Go Heels! graduated… the “d” key is stuck on my keyboard! youre really suppoesed to take three parts water. but in the end it still isnt as good as mod podge, which is extremely expensive. 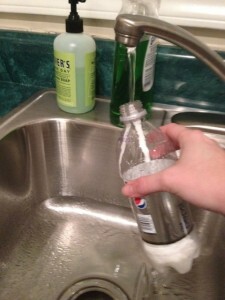 @sydneychopper Actually the multiple recipes I found for this said that you’re supposed to use equal parts. But you’re correct, it’s not even close to it’s expensive counterpart. It’s just watered down, water-soluble glue, whereas Modpodge is thicker than elmer’s to begin with. I wonder if having equal parts of water, glue and cornstartch would make it thicker more like mod podge? @AleishaWoodReynolds I like shiny things. Hilarious. Thank you for making me laugh. Five times. always ask yourself “is this acid free?” I know that Elmer’s glue is NOT. There for placing it on any art piece, will be a waste. Take it from me, when I first started crafting I never used acid free glue, or acid free items, I just thought it was a hoax to get us to buy more expensive items. 10 years down the road, I have bleached out papers, ruined pictures, and lots of money wasted. Make Sure it is ACID FREE!